This is the second post in an emerging series tackling the theme of church from a very practical, honest, and hopeful perspective. The first post giving advance notice of where things are headed, and what has inspired this series is here, so please read it first for context. I want to use this post to sketch out my own journey into church, and my history in the churches I have been a part of. Fear not. This will not be a horribly long post. But I think it’s the necessary starting place for the longer discussion I want to have because everyone’s story (experience) shapes their unique perspective — and I definitely have a story about church. I do understand that some people reading this will be unsettled, uncomfortable, or even angry about what I write here. I’m not trying to hurt you. I’m trying to talk about my journey in Church as someone who has a lot to share. My hope is to be honest, and to be edifying — even if the truth hurts. There will be people who could blog about their painful experiences in church, and they’d be thinking of me as they wrote. I accept that fact. It’s part of human experience and relationships. With that in mind – read on (and know that I don’t name any people in this post unless using their name is positive). I did not grow up in a religious church-going family at all. Church was not something our family really ever did. It was more a family tradition to poke fun at church-going people than to join them for a Sunday service. That fact often shocks people who learn that I spent most of my adult life in pastoral work, but it’s true. I didn’t become a Christian myself until I was seventeen years old. Up to that time, I attended churches on occasion by hopping on the old neighborhood Sunday School busses in Colorado, responding to invitations to Sunday School from kids at neighborhood churches, or attending the (no-longer-in-existence “Atonement”) Lutheran Church in Granger Utah with my Aunt JoAnn when we moved to Utah back when I was nine years old. I enjoyed Church when I would attend as a child, but it was unusual for me to go. It did get me curious about the Bible, and about Jesus. In fact, I often tell people that because of my early exposure to churches through various Sunday School lessons, I developed a “Jesus-shaped-God.” So, you should know right off the bat that I see value in things like neighborhood Sunday School outreaches, and your Aunt inviting her nephew to church with her when he’s nine. However (and this is where my present idealistic ecclesial convictions want to add a caveat — which may cause you irritation, but stick with me –), though I am grateful for her outreach to me, my Aunt JoAnn didn’t need to take me to her church building so the Sunday school teacher could teach me about Jesus. Anyone who has an aunt who knows Jesus is in touch with the person who has everything they need to share the gospel, and be an expression of church to a nine-year-old. This is NOT a slam on my aunt. She cared enough to do what she knew how to do. I’m so grateful. But it is a preemptive push-back against the notion that I could not have learned about Jesus from her without the scheduled church service on Sundays at her church building (which is no longer there). This is the myth behind so much of what has become church in North America (and perhaps much of the rest of the world). More on this later — but I hasten to conclude with… “thank God for Aunt JoAnn (who went to be with Jesus last year), and Atonment Lutheran Church (though such a place no longer exists on the map or at a street address).” Whew! I became a Christian at age seventeen in Salt Lake City, Utah. A short-term missionary named David DeGrazia was street witnessing with some YWAM missionaries on July 24, 1986. I was out there intentionally searching for God, and I met the missionaries on the street. David shared the Gospel with me in a store-front window, wrote a few verses of scripture on a note pad, prayed for me, and ran to catch up with his group. Two days later I accepted Christ on the hood of my car in the middle of the night. I later connected with David, and we’re friends to this day. In fact, he visited the church I was pastoring on my 25-year salvation anniversary, and we went back to that same spot to share Jesus with others. David was also at my seminary graduation a few months ago. David was instrumental in discipling me through the mail by sending me tapes, books, and hand-written letters with bible studies and encouragement. Because I was only seventeen, and because my family had no idea what to do with me after I became a Christian, my parents would not let me attend any church. When I turned eighteen, I quickly began attending the Vineyard Christian Fellowship in Salt Lake City, Utah. The nice lady who worked at the Christian book store in Salt Lake City recommended it to me. I was only there for one month, and I got baptized there on July 5th, 1987 – two days before flying to San Diego to go to Navy bootcamp. Both of my parents attended my baptism. During my month at the Vineyard, I joined a kinship group (a home group), and spent my last month in Utah trying to learn everything I could from this group of people, in addition to joining them for worship on Sunday mornings. It would be 25 years before I would go back to the Vineyard in SLC for a visit (for my salvation anniversary), but their impact on my life for that first month was measurable. San Diego – During my six years in the Navy I attended a few churches, and for the first couple of years, I really enjoyed it. After bootcamp, I lived in San Diego for several months and attended Skyline Wesleyan Church for several weeks (while John Maxwell was the pastor), as well as attending a few services at the Vineyard in San Diego (which met in a High School) and Horizon Christian Fellowship pastored by Mike MacIntosh. I only stayed in San Diego for a few months. It wasn’t enough time to get plugged in to any one church, but I did enjoy the idea of being surrounded by fellow Jesus-people, immersed in worship music, and taught from the Bible. I was a young Christian, and I was trying to catch up! Being a part of these churches was helpful to me in terms of acculturating into charismatic expressions of church in evangelical North America, and getting a value for fellowship, biblical teaching, and learning that there were millions and millions of fellow Christians in the world. I was part of something bigger than I had ever imagined, and going to these churches awakened me to the fact that my Christian family is huge! Lemoore – After a short season of bootcamp, training school, and a brief stint at a reserve base in Utah, I was stationed at the Naval Air Station in Lemoore, CA. During my season there, I attended two very different churches. The first was Koinonia Christian Fellowship, and the second was the Lemoore Assembly of God. Koinonia was very relaxed, very centered on biblical teaching, community, and worship. Lemoore Assembly attracted me because it had a larger youth group, and room for me to grow in my desire to play piano in worship. I attended both churches off and on during my time in Lemoore. Both churches also immersed me into the various characteristics and idiosyncrasies of North American pentecostalism, the charismatic movement, and church culture in general. Before I knew it, within only two years of being a Christian, my whole life essentially revolved around going to work and going to church or hanging out with church people. It was also during this season that I entered into a very focused discipling relationship with a friend at Koinonia, and developed a ravenous appetite for biblical studies and Christian books. I used to volunteer a lot at Door of Faith. One Saturday I volunteered to rake leaves and clean up around the outside of the Church building after a storm. I was alone, working, praying, and thinking about my life. I asked God, “What are you going to do with me in this life? What’s my calling?” I very distinctly remember calling to mind Jesus’ charge to Peter after the resurrection.. “Feed my lambs.” I have often reflected over the years that it was at that moment, when I was 22 years old, that I knew that Lord had put a pastoral gift, and a passion for teaching into my heart. That would be my motivation for the next 20+ years with respect to my own involvement in Church. I met and married my wife on Okinawa when I was 23, and we left Door of Faith to serve my final six months on the island at the Okinawa Korean-American Presbyterian Church. That was my first fore into pastoral work. My wife and I led worship together, and then she taught Sunday school for the kids while I taught verse-by-verse through 1 John to the American servicemen who brought their Korean wives and Children to church. New Mexico – I decided to leave the Navy in the summer of 1993, and we moved back to New Mexico to be near Jo’s family. We attended the church that sponsored her missionary work on Okinawa – Trinity Christian Fellowship. We worked in Christian Radio together, and immersed ourselves in the work of the church through children’s ministry, worship ministry, teaching a young adult fellowship, and preaching in the Wednesday night service. It was a sweet group, and my own passion to move into full-time vocational pastoring grew during that year. But our income never grew, so we moved from New Mexico to my home-town in Salt Lake City, and continued our lives there for the next three years. Metro Fellowship – When we got to Utah, we immediately plugged in to the Church that was responsible for hosting the YWAM team that witnessed to me on the street seven years earlier. It was an Assembly of God church called Metro Fellowship. I was excited to be connected to something that had such a dramatic role in my own salvation, so we jumped right in. I was also enrolled in Bible College courses through Moody Bible Institute in Chicago, and the pastor at Metro offered to proctor me through the courses. During our weekly meetings, he invited me to come onto the staff of the church to lead worship, oversee Christian education, and help administer finances. I remember taking my wife out to Chili’s to tell her I was going on staff at Metro. I remember thinking, “Wow. I’m only 25, and I – yes I – am on staff at, uhem, Metro Fellowship. I have arrived. I am in the ministry now. Check me out!” or something like that. But it was at Metro that I discovered the under-belly of church. Over the next two years, I would have many of my ideals crushed, and most of my immature thinking about church completely wrung out of me. It was at Metro that I experienced both the joy of rich fellowship, and the shock of human failure. And it is precisely because of my experiences at Metro (and every other church I have been involved in since that time, including even the one I pastored) that occasioned the Facebook post that I quoted at the beginning of the first installment of this series. After just over two years at Metro, we decided to resign, leave Utah, and move back to another familiar place in my journey with God — Lemoore, California. Koinonia Christian Fellowship – I was part of Koinonia in Hanford/Lemoore back in my Navy days, and my wife and I decided we’d risk it all, pack up all our belongings, and strike out anew in Lemoore. I often told her about the profound impact that Koinonia had on me, and we both felt that it was a safe place to land after our tumult at Metro. My wife accepted a position in their private elementary school, and then two weeks after we arrived in Lemoore, I was asked to come onto the staff as an associate pastor and worship leader. We were at Koinonia for four years, and during that time, the church grew from around 500 people to over 1,000 people with multiple services. It was one of the most difficult seasons of life, ministry, and marriage for me and my wife. At the end of our time there, leadership failure and all of the human frailty that often comes with it brought us to the place where we could not stay. And again – there was the church, and there was the business. Two competing powers. Two competing sets of values, trying to live together under the same roof, and two very different approaches to solving the problems that arise in business and church. We left in June of 2001. The Oasis Church – Three and a half months after leaving Koinonia, we did the unthinkable. In September of 2001, we started a church in the same town where we had been living and ministering for the past four years. And we started that church primarily with people from Koinonia who were friends. That’s called a “church split” in ecclesial street talk. But if you’re into grace, diplomacy, and the possibility that God was involved despite human failure, you could adopt C. Peter Wagner’s language of “unintended birth.” However one chooses to frame the birth of The Oasis, the actual life of the church while we were there were the most wonderful years we ever spent with a church. And that is not to say that it was always easy, or that we did everything right. But we were there for twelve years. In the months after our church began to meet, we forged a relationship with the Foursquare denomination, and we were “Foursquare” for the entire time we pastored the church. It was during my years at The Oasis Church that I truly grew in my appreciation for relationally-driven ministry, the role of elders in congregations of Christians, and the value for small groups of Christians being connected to something bigger than their own local gatherings. From everything I knew about church, the only way to do this was to do church the way everyone in America does it (e.g. 501(c)3, denominational affiliation, programs, Sunday services, staff, budgets, etc. ), and connect to a denomination with which I found theological agreement and relational care and camaraderie. We finished our season at The Oasis Church in November of 2013. It was a very positive and very gracious experience for us. A combination of life-events, including completing graduate and post-graduate eduction, re-thinking our ecclesial convictions (especially as a result of my wife’s doctoral studies in ecclesial leadership), and the sense that our time in that version of pastoring was concluded, brought us to the place where we were ready to resign and move into other things. In keeping with the fact that we had connected the church to a denomination, we followed our denominational protocols, and turned the transition of the church over to the denominational overseers. Even at the end of that story, it is difficult to know how to draw the lines between what was church and what was business. It is something I am still watching, still thinking about, and still processing. For those who wonder, “Well, what do you actually think of church now, and what is your concept of church after all these years,” you’ll need to read the next post right here. Thanks for reading. Does any of this speak to you? Do you have any questions or insights you want to share? Leave them below. Good posts Kenny, I think I see where you’re going with this. I agree with your contrast between God centered fellowship outside of a 501(c)(3) governed building but am curious as to what you think of church ceremony and ritual. Does it have a place in our lives/church biblically? My gut tells me that if the Bible emphasizes a ceremony it should be important. 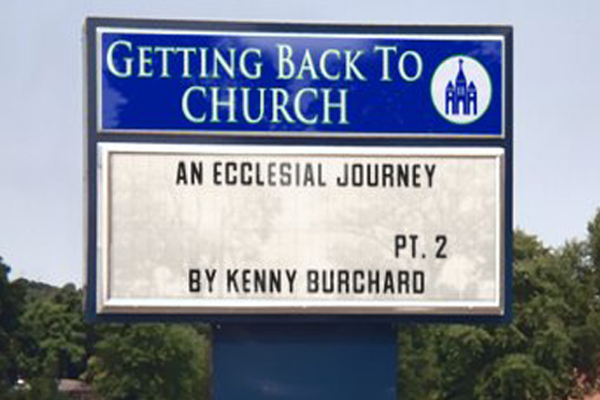 Excited by where you are going with this, Kenny! Thanks Orlando – Let’s use this space to talk more about what you mean when you use the word “Ceremony.” What things do you have in mind? I want to be sure I’m talking TO you rather than around you if/when I delve into this part of it. Thanks JP – It’s a journey. I’m glad you’re following. You were actually part of it with us (as you walked out your own journey) for about 16 years!!! I’m liking this series so far. It’s nice to hear the little summaries of your experiences, especially those four years where our church journeys crossed paths. 🙂 Glad to have finally found your blog! I’ll be following on Feedly. Joel – Great to hang out with you guys, and so great to see you here at ThinkTheology. Kenny, this speaks deeply to me. Our histories share some common points, even Door of Faith on Okinawa! I, too, am saddened and puzzled by the difference between the relational and the “business” sides of the typical church. Ecclesiology is becoming such a huge topic. I have always been impressed with Jack Hayford’s model of “temple” on the sabbath and “house to house” during the week, but the “temple” idea seems in trouble, with the “business” swallowing up the relational (and the house to house unable to compensate for the weekly focus on things more of this age than the Kingdom). Yet, as a historian, I know that house/simple/organic church movements have been good for the church, but never a solution. So, in concert with another commentator, what is the need/use of authority structures, accountability structures, and liturgy (the weekly plan of worship/word/prayer/communion) from your point of view? So I attended all of the same churches as you when I lived in San Diego. James – WOW! We need to talk about Door of Faith and your connection with that movement. Also, I’m really going to start unpacking what is in my own head re: ecclesial “What, How, and Why” questions in the next two posts. I think every contemporary student of ecclesiology should be required to read at least one book, and write one paper on the unique ecclesial dynamics happening in the underground church in China over the last 25 years. I think they are a template for some “forgotten ways” and buried ideals (though nothing humans are involved in will ever be wholly ideal). If only John Maxwell had one a better job convincing you (or anyone else) about the supremacy of Wesleyan-Arminian soteriology. bwahahahaha. Another Door of Faith? I recall DOF days. Interesting. Paradox? Hmmm. I have limited understanding of the under belly of the church; however, I know that Harbor Seals swim upside down so they can see and halt the sharks from eating them. Humor aside(but needed)…pride and unaccountable. Very recently I listened to an MIT Economist(non-Christian) share his findings from a study he did(B-paper) on religion. Of course, nothing about the Holy Spirit or Truth but rather the sociological part and money. It may not be anything new to you but I post solely to support your testimony. As my father was passing away he shared a truth. “Be weary of paradoxes and lose not your consciousness”. Are people who make the ‘church’ allowed that? If people can “work out their salvation” without becoming weary and unconscious, I want that bowl-a-Emotions. You have done a great job. Love you bro. Jon, I was there in 1973-74. From December 73 to January 74 I was lay co-pastor of the church with another Air Force sergeant. When were you there? Hi James. Ken was there before I got there and I left before Ken left. I testify that the time with all the families was great honest fellowship as Ken said. That was 24 years ago for me. Jon, it was rough for me. I loved the people, especially the youth (about 60-70% of the congregation at the time). We had good youth leaders (Ken and Bobby). I introduced them to the Baptism in the Holy Spirit and the people to charismatic worship. Unfortunately, at that time the ladies in charge were solid Wesleyan-Holiness, and, also, I had made some cultural mistakes. They became offended at me but not outwardly. It got a bit ugly. After I left, I was rescued by one of the Light of the World pastors, Pop Quisenberry. I learned a lot from him. Kenny – pieces of your experience are very similar to mine. Enjoying this series. Need to have you guyz up for dinner or vice-versa sometime. Prof. Henderson – I am intrigued by your historical insights on why house-churches may not be the overall/final solution. I have written elsewhere on this blog exploring the idea of developing a model which takes the best from organic as well as institutional church ( http://thinktheology.org/2014/07/22/organic-vs-institutional-church-happy-medium/ ) and have wondered if some of Ralph Moore’s cell church model could be helpful here (see also http://thinktheology.org/2014/07/29/neighborhood-based-house-churches-corporate-organization-supports/ ). Perhaps we chat more on this topic sometime. Brad – I think that would be awesome! I had also been thinking about Jim’s (prof. Henderson – who lets me call him Jim and takes me to coffee and loans me lawn chairs) observations about house churches too. I am personally averse to using any nomenclature like “House Church” or “Traditional Church” or anything like that at this stage in my own journey because I think models become heavy-laden with preconceived notions (like, “We meet in houses, so we’re a house-church). I also think that it is a way of marginalizing what is normative in the New Testament, and making the current way church is conceptualized and “done” the “normal” way to think of Church. Finally (then we’ll let Jim chime in), I actually think Hayford’s value for Temple/House becomes anachronistic once the church leaves Jerusalem.I don’t think believers in Corinth, Ephesus, Colossae, etc. ever would have conceived of such a thing, or tried to duplicate it based on what the Jerusalem church was doing. I think they were “doing church” within the rhythms of their Jewish life and culture. In that sense, I don’t think the New Testament gives us an ideal model for congregational life that looks something like “Temple and House to House.” I see that as way more descriptive than prescriptive. And I think that the congregations in the Gentile cities that met house-to-house WERE capable of seeing Christianity grow from a few thousand believers to tens of millions within the first 250-300 years of Christianity (pre-Constantine). Jim – see the comments on Brad’s thread below. Jump in. positive role. For example, the Pietist movements in Germany and Scandinavia, the Moravian revival, the Methodist revival in the British Isles, and the Methodist circuit riders who conducted what were essentially house churches on the American frontier. The Tuesday Night Meeting for the Promotion of Holiness in New York City might be another good example. All of these promoted worship, discipleship, and accountability in a “body” or family kind of structure. On the other hand,none of these movements lasted. Most of these home church movements were essentially reabsorbed into the institutional church, whether one already established, or one that was founded as the culmination of one of these movements. So, we see a pattern of the life of the church renewed as people become hungry enough to meet outside of the liturgical assembly, but a new generation or new circumstances calls the order and stifles the movement. I cannot think of a single movement that did not either fall apart completely or result in a new church institution. hierarchy or authority structure – can be helpful, but are not the answer. Without a theological center, such movements seem to inevitably become about something else, whether it is social action, or the experience of worship, or spiritual enlightenment, or whatever. churches of a city appeared to cooperate together, whether they used a “Council of Elders” or whether they submit themselves to someone that they elected Bishop. I am also thinking about the need for more tradition and structure in the assembly (in whatever sort of group). These are reasons why Jack’s model has appealed to me. There is the liturgical, and then there is the relational. Neither is neglected. I’ve seen it work in more than one place, if the leadership is able to teach the Bible (or at least to teach a prepared lesson), and is able to pray with power for the needs of the people. Full disclosure requires that I say that I’m not completely happy with any model and am personally quite tired out by the church in all forms. a synagogue. They sacrifice themselves to work outside of their office as Rabbi to make a living, even while being thoroughly enmeshed in the lives of their people. Since rabbis are father figures, as well, I wonder if this model might work for Millennials who have such a hunger for father figures. is my absolute position. I look forward to your responses. “Without a theological center, such movements seem to inevitably become about something else, whether it is social action, or the experience of worship, or spiritual enlightenment, or whatever”. I am glad you posted this Dr. Henderson. From that point, the MIT professor supports just that structure. Ken I so appreciate that you request us to remove popular name stamps. So after 9/11 when I sensed my family was to move, we left our first “start-up” church(Jon Alsdorf) for which as more joined disorder came about. People jumped to be on the board or on the worship team rather than doing what? I hope not to grab Ken Blanchard’s Organizational Leadership book alone and invert the business model because the church is not a business. After discovering that the destruction of the start-up was due to board member spouses, well then where does Dr. Blanchard speak of that especially in our culture. Thus being not a pastor or a biblical professor, I may come from Master Chief’s position in saying that great good has come. However I can list almost 10 pivotal events based from Ken’s paper where cracks of compromise turned into huge crevasse for which a variety of “members” of that church halted, cursed and left God. Is “Council of Nicea” for the inverted purpose to save people from leaving “the church” rather than organizing all the pagans who rushed in called? Appreciate all of the posts. Ken I am excited to better understand this and reform my past thinking and feelings. We fear men so much, because we fear God so little. One fear cures another. When man’s terror scares you, turn your thoughts to the wrath of God.